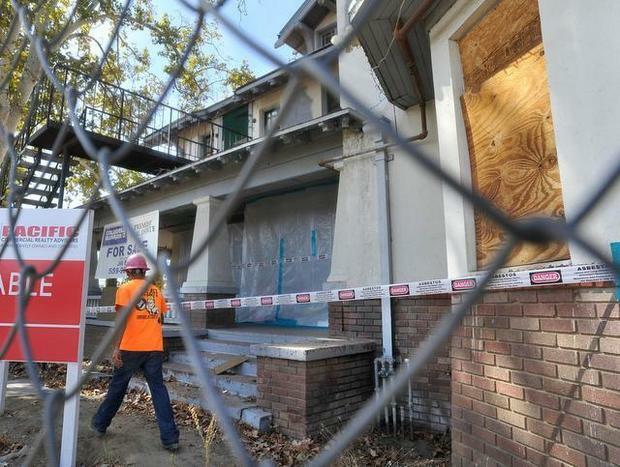 Motorists driving by Wolfe Manor in Clovis will see some activity at the “haunted house” this week — not the paranormal kind, but enough to stir up some curious spirits. Asbestos removal in the nearly century-old house, which was once used as a Halloween attraction and featured on a number of ghost investigation television shows, began Monday, paving the way for demolition of the building early next month. The city of Clovis has forged ahead with plans to clean up the 1.25-acre property, southwest of Sierra Vista Mall on Clovis Avenue, after trying to work with owner Todd Wolfe on giving the house and the land a new life. Wolfe, however, is still trying to sell the house and even offers to donate it for free to the right buyer who is willing to move it. If all his efforts fail, he hopes to at least be given some time to salvage anything of historical value from the house so he can sell it later. “We thought we had more time,” Wolfe said. Clovis designated the house “unsafe to occupy” about two years ago. Then the city’s Board of Appeals declared the vacant house a nuisance last year and a danger after finding 22 building code violations.